Asylum for Idiots and Feeble-Minded, Orillia. I have been working on both my family history and that of my husband’s family for many years but only in the past year have I made true breakthroughs in researching my husband’s side of the family. While I enjoyed years of my Grandma’s family stories and childhood memories, my husband seemed to have little information on his relations and the lives of his ancestors. I have had to walk a tight rope to extract family knowledge from my husbands’ parents and grandparents without becoming an irritant. It’s often a fine balance between being pleasantly interested and annoyingly nosy and harassing. Slowly, as I’ve taken the information granted me and run with it, I have managed to win over my in-laws and even excited their interest! Now that my husband’s family respects and appreciates my research efforts they eagerly entrust me with their family history queries, and puzzles. It amazes me how often a new mystery surfaces. This summer my mother-in-law mentioned that her mother had, had a younger brother Robert Vincent Martin who was sent away to an institution as a child. She was hoping that maybe I would be able to track what happened to him. She believed he had been sent to an asylum in Orillia, Ontario when she was just a child. She could remember nothing else. A quick Google search was all it took to find the asylum, The Asylum for Idiots and Feeble-Minded, later renamed the Huronia Regional Center. 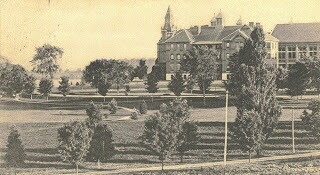 This institution was in operation from 1876 to 2009, first as a hospital training school. Modeled after those in Britain, it was meant to actually educate those termed “idiot” or “imbecile” children. In the 1900s however the rise of the eugenics movement changed the focus of such institutions from education to seclusion and segregation. Born in 1932, my husband’s Great-Uncle Robert was admitted in the mid 1930s. We do not know the condition he suffered which would have been the impetus for his parents decision to institutionalize him. His sister, my husband’s Grandma, remembers visiting him only once as a child. Grandma says she has never understood why he was sent away and it has haunted her much of her life. The thought of this tore at my heart and my spirit. Though I did not know him and he was not my relation, this new research challenge had become emotional and personal to me. I began by reading as many online articles as I could on the Hospital. I came across author/researcher/advocate Thelma Wheatley. I contacted her through her website to ask about further sources of information and she referred me to Marilyn Dolmage who was aiding former patients in their class action suit against the government of Ontario for abuses they suffered while in the custodial care of the Huronia Regional Center and other similar institutions across the province! Marilyn had access to government lists of Huronia patients and found Robert! According to her information he had been transferred from Huronia Regional Center to the Oxford Regional Center, a similar institution in Oxford county, Ontario, in 1960 and he died there April 29, 1993. I was unsure what motivated the transfer. In 1960 celebrated Canadian journalist and historian Pierre Berton, then writing for the Toronto Star, wrote a scathing report detailing the horrible living conditions of the Huronia facility (Reprinted in 2013). I wondered if perhaps he was moved by a family member when Berton’s article raised concerns. Or perhaps the shuffling of patients was meant to remedy the overcrowding at Huronia, Berton had shone a light upon. My heart broke when I read horrific accounts of abuse. All we could hope is that Robert escaped the worst horrors. Aware that Grandma’s brother had now passed we hoped to obtain his patient records to find some sort of closure and peace of mind. The Huronia Regional Center records and those of the Oxford Regional Center once held at the Ontario Archives–but protected by the privacy act–are now available to patients and their next of kin through the MCSS (HRC.MCSS@Ontario.ca). We are in the process of requesting these records and are hoping obtaining these records and learning where Robert is buried will be a salve for the hurt Grandma feels and the emotional sympathy we are experiencing. A long, lost relation is finally found! ← Black Sheep Sunday: My Darkest Black Sheep Revealed! What a fascinating story! I, too, enjoy genealogical research for my and my husband’s family. Your results inspire and energize me. Thanks for sharing your success.